I am going to discuss with detail about the Medical Allowance for the employees of BPS-16 & Above. 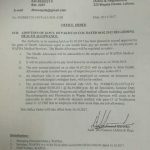 Various visitors of GLXSpace.com (Galaxy World) aroused a question that they have been upgraded/promoted from lower scales to BPS-16 and above but their Medical Allowance is the same as they were earlier availing. They asked why the Medical Allowance is not 15 % of their Basic Pay. I will illustrate with examples about Medical Allowance. 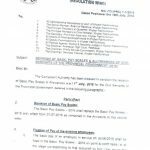 In the revised pay scales 2011 notification it is clear that Medical Allowance to Civil Servants in BPS-16 and above @ 15% of the existing pay in Basic Pay Scales 2008 shall continue to be admissible at the frozen level of its admissibility as on 30-06-2011. All the new entrance in BPS-16 and above shall be allowed Medical Allowance @ 15% of the minimum of relevant Basic Pay Scales 2008 on notional basis with effect from 01-07-2011 till further orders and shall stand frozen at the same level. This anomaly says, “BPS-16 and above officers/officials may be allowed medical allowance @ 15% of the basic pay of BPS-2008 subject to minimum Rs.1000/- PM. It is clear from the above examples that a new entrant employee in BPS-16 after 01-07-2011 will get Rs. 1000/- as Medical Allowance. However if any employee above BPS-16 has more pay according to BPS-2008 whose 15% is greater than 1000/- he/she will claim more than 1000/- as the amount is admissible of the 15% of the pay of BPS-2008. hi mam hpe u fine there. Dear Zubair Khan, there will be no change in Medical Allowance. Dear Asif, Medical Allowance In Sha Allah jald minimum 1200/- ho jai ga for BPS-16. 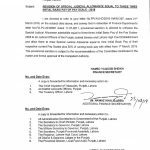 AOA, madam, if an employee is upgraded from BPS-14 to BPS-16 after 01-07-2011, he will get Medical Allowance 15% of the Basic pay that he was drawing on 30-06-2011. And subsequently if he will be promoted/Upgraded to BPS 17 or BPS 18 after some time then what will be the Medical Allowance same as on 30.6.2011 or Minimum of the new scale of 2008? Dear Usman, it will be the 15% of the concerned pay scales 2008. Dear Madam, you mean Medical Allowance will be 15% of the minimum of the concerned pay scale of 2008. e.g., 15% of initial of BPS 17 if he will promote to BPS 17 from BPS 16. Dear Usman Khan you are right. if medical allowance, of an employee who upgraded/promoted from B-14 to B-16 or B17, 15% of B.Pay on 30.6.2011 is higher than the medical allowance of 15% of intitial of B-16 or B-17, then what will be the medical allowance? The employee will get the medical allowance which ever is greater in these conditions. Thank U so very much for clearing the poing. We really appreciate your efforts. Best of Luck. Madam Thank You sooo very much for clearing this main point. We really appreciate your such nice efforts. Wish u best of Luck. Dear Maqsood u ll get Rs. 1000/- per month as Medical Allowance. thanks,mera yeh 11520*.15=1728 ,kis date say due hay,jis ka main claim kar sakta hoon. Dear Tahir, u can claim it from ur date of upgradation i.e prior to 30-06-2011. I think ur date of up-gradation was May 2011. Yes dear Iftikhar your MA will be Rs. 1665/-. 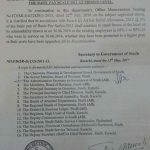 According to the Office Memorandum dated 21-10-2013, issued by the Finance Division, My pay was in BPS-15 Rs.11100/- Now I am serving in BPS-16 as Assistant Private Secretary (S/G) w.e.f. 23-12-2011 what will be medical allowancea dmissible ? Dear Iftikhar Hussain, your medical allowance will be 15% of the pay that you were drawing on 30-06-2001. Dear Madam! Thanks for reply, a premature increment had applied on upgradation of post w.e.f. 1-7-2007. Is it applicable and merge after fixation of pay from BPS-15 to 16? Dear Iftikhar it will be applicable for all the upgradation cases but under the rules. It is a great advantage for us being a Govt employee that you provide help and legal guidance with rules and regulations in service matters. Please guide about the criteria for admissibility of charge allowance to SST holding temporary charge of Headmaster of High School due to transfer of regular Headmaster or proceeding of long leave. Who is competent to sanction it, what will be rate of the allowance and upto what period sanction will be valid? Please guide with references for the Punjab Government employees. Dear Saadat Khan, now the verification of the same has been issued by the Finance Div. You can see the same at mine site, that must be within the last 20 posts at mine site. I am serving in BPS-18 (lecturer) in Gov University Islamabad, my wife is also in same university and same Grade. What medical allowance should we get? both 100% or both 50% or one person=100% and other =50%? Dear Neveed both will get 100% Medical Allowance. I am a Federal Govt Employee working in an attached deptt as APS, we have got a letter frm MoD that we are entitled to get 15% Medical Allowance on the Pay we were getting on 30-06-2011. But still it is not fixed by our deptt.. As they are going to fix it through CNA but since when it is not cleared. Should it be since July 2011 when it was freeze...???? Kindly do help me ? U r almost thr, when i need ur advice. U are always welcome Dear Batool. 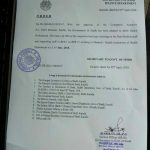 Dear M. Shahzad Anwar Computer Allce is not allowed to Assistant Personal Secretary. I think there is no criteria, because many of stenographers who were up-graded, working in different ministries/ divisions/departments are getting medical allowance more than Rs.1000/-, i have evidence i.e. copies of pay slips, how they are getting this benefit? Plz send me the evidance at mine email. Dear MA anomaly that you posted it is issued by the Faderal Govt while we are working under the Provincial Govt. so please clarify that it will apply for all of us? mean lower amount to receive in Medical Allowence is 1000 while in current we are receiving 909. Dear this anomaly of Medical Allowance is issued by the Federal Govt and is only for the Federal Govt Employees. Then it is useless for all of us that are working under the Punjab Govt... you are here by requested to please upload notification here sepretally mean Faderal or Provincial. Dear as soon as I receive the same Notification regarding Medical Allowance Clarification, I ll publish it at mine site. Mera sawal hy ke Pay Scale Revised honge ya nai? Dear abhi kuch bhi nahin kaha ja sakta. Behan Shumaila sahiba I am working in bps 16 since 2009 but I am getting Medical Allowance @ Rs 909 pm. What is the exact amount of m.a. for me? According to anomaly new appointee MA amount is Rs. 1000/- PM. Just send me ur pay on 30-06-2011 by email so that i may tell u about ur exact amount of MA. But I think, this is injustice, to bring someone, who is promoted from lower scale to BS-16 or above, at the minimum level of higher scale in respect of Medical Allowance. The colleagues who are promoted before in or before 2011 are getting near Rs.3000/- and new promotee gets Rs.1000/-. But i think, lawmakers have not time to see the problems of others. govt has refused i.e jinnab hafeez shaikh said they dont have money to increase salaries.so dont hope for UPS/pay scale changes. It is to clarify that 15% medical allowance is allowed on running basic pay and not on initial basic pay. On upgradation and promotion the medical allowance will be allowed to him on his running basic pay against basic pay scales 2008.
dear medical allce has been frozen wef 01-07-2011. just read this topic again carefully. Abhi brother kuch bhi nahin kaha ja sakta. Shumaila i heard the news about fourtier formula in fgei cg according to which benefits are given from 2001. The notification copy is in the Regional office Gwa as seen by some people. can u publish the same copy for all viewers of ur site?